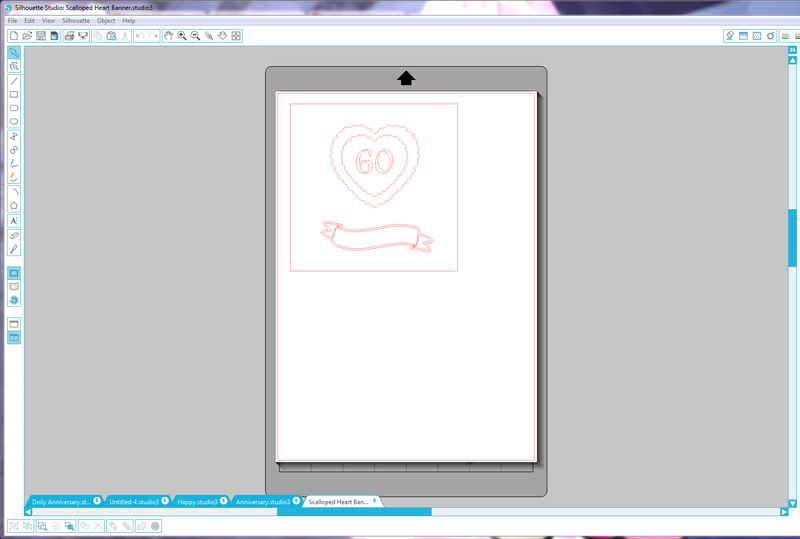 It’s my grandparents 60th wedding anniversary later in the summer and I decided to get a head start with their card. Using good old Pinterest for inspiration I got together two solid ideas for cards and here’s the first of them. I knew I wanted something nice and traditional looking and so thought the Papermania Capsule Collection ‘Parisienne Blue’ would be perfect and would mean I wouldn’t have to go down the old red for anniversary route. Quite a simple design. But the papers I were using were quite busy, and so I knew it wouldn’t end up looking boring. 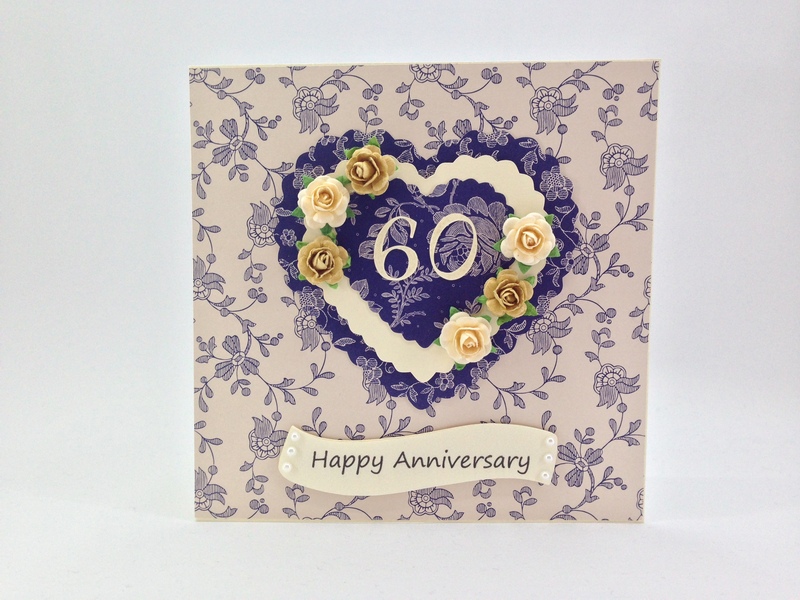 To begin with, this card was supposed to be a mix of Parisienne Blue and Papermania’s Oyster Blush collection, but once the background paper and hearts were cut out in them, there was just too much going on with all the colours and flowers. I also felt two hearts wasn’t enough. To rectify both issues, without making the card even more fussy, I settled on two hearts in the blue and another in cream cardstock, sandwiched between the two blues. 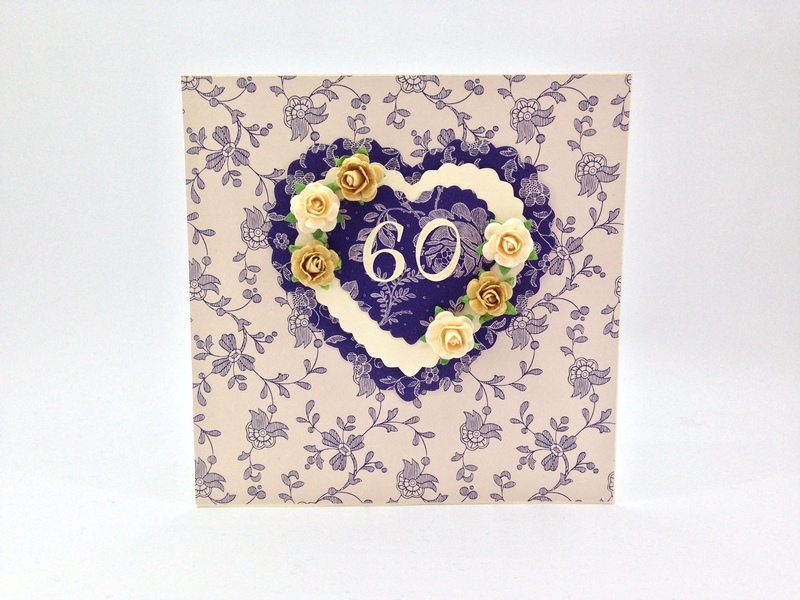 Next came the number 60 and as 60 years is the diamond anniversary I wanted to make it kind of match the theme. To do that I cut out 60 in cream and finished the letters off with a little sparkle using my new Wink of Stella glitter pen. I love how subtle the clear version is and so I was able to cover the whole number and be left with just a hint of sparkle. Perfect. I was really liking how it was turning out. The first blue heart is mounted flat to the background, with the cream on 3d foam dots to make it pop a little and the final blue heart is again just flat. Like I said, the patterns are quite busy, but I find the cream breaks it up nicely. I also found when it came to trying to add the banner in cream cardstock to the design with no other cream in the card it just didn’t look right, so having cream elsewhere was a must. The banner I struggled with. Mainly because I don’t have any happy anniversary stamps. I’m good at finding that I don’t have stamps to fit occasions at the moment! I rectified this little issue with the print and cut feature of the Silhouette; printing out the sentiment I wanted and then cutting out the shape of the banner. I cut the words out in some textured cream paper and then glued that onto some card to make it sturdy. I’d have printed straight onto the card but it’s A5 card and my printer was making it difficult to print onto! I decided to just use the middle bit of the banner cut to keep it nice and simple but it was looking a little bare and so finished it off with a few adhesive pearls. And there we have it. I’m really pleased with this. I’m just hoping it’ll fit in an expandable envelope so I don’t have to go through making a box card envelope – I hate those with a passion.